Warrior LPC is the latest in the line of low profile, high speed chest rigs. The LPC holds 4 x 5.56mm x 45mm Mag pouches including PMags in our elastic low profile mag pouches. There are extra rows on MOLLE webbing at either side of the LPC which can accommodate a multitude of interchangeable Warrior pouches, such as pistol mags, Radios, etc. The LPC works particularly well with, Warriors PLB Belt or Frag Belt combination to provide a lightweight Direct Action setup. 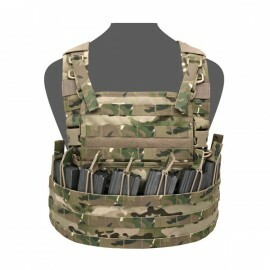 Made from genuine US MilSpec materials and hardware.